Long, long ago, when I was just a child, one of my favorite television shows was a series called Wishbone. Wishbone was the name of a terrier owned by Joe Talbot, a youth whose father died when he was a boy. Wishbone was his loyal pet who also had a nose for classic books. Throughout the series Wishbone would picture himself in the leading role of some classic. He would be Romeo in Romeo and Juliet; he would be Dr. Frankenstein in Mary Shelley’s Frankenstein; he would be Odysseus in The Odyssey, and so on and so forth. I loved the show, both for Wishbone’s sense of humor and the exposure I had to all these different classics. It was a good way to introduce children to classic stories, in my opinion. The series only ran for two seasons, but it made quite the impression on yours truly while it lasted – obviously. 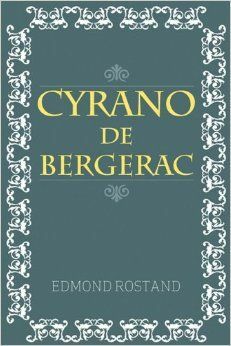 One of the episodes I liked best was Cyranose, based on – you guessed it – Edmond Rostand’s play Cyrano de Bergerac. The story of a musketeer with a long nose and a sharp wit caught my attention. I loved Cyrano’s ability, as demonstrated by the witty Wishbone, to lambast people with a great quip. When I got a little older and learned which book was the basis for the episode, I knew I wanted to read it someday. It was not until several years later, though, that I was to get my hands on a copy of Cyrano de Bergerac. Written as a play in 1898, Cyrano de Bergerac stars a French musketeer with a great big nose and a brain twice that size. The epitome of chivalry, Cyrano de Bergerac has never known the love of a woman because of his unsightly appearance. The nose is just too much for the ladies. But Cyrano is, in fact, in love; he is in love with his cousin, Roxann, the most beautiful woman in France. At least, as far as he is concerned she is the most beautiful woman in France. Not many people are wont to disagree with him on that opinion, so it seems to be the consensus. Roxann is as beautiful as they come. However, Roxann has never shown the slightest interest in her cousin, romantically speaking. She loves him, but only as her cousin and childhood friend. She also loves him as an intellectual equal. Roxann is one of the smartest women in France, as Cyrano is one of the smartest men. But even the smartest of us are not always the brightest. Roxann has developed feelings for the newest member of Cyrano’s musketeer company, a man named Christian de Neuvillette. Christian has the looks Cyrano lacks but no real ability with words. Every time he tries to talk to a woman, he either says nothing great or becomes too forward. Roxann is determined that no harm should come to him, though, and she therefore asks Cyrano to watch out for Christian. Cyrano takes up the post out of love for Roxann and finds that Christian is smitten with her, too. But he also learns the boy has no prayer of gaining her love on his own because he cannot form coherent sentences when speaking to a woman. So Cyrano comes up with a plan. He will use his ability with words to make Roxann truly fall in love with Christian. The plan works a little too flawlessly; but Roxann is happy, and so Cyrano does not begrudge Christian his victory. The victory ends in tragedy, however, and Cyrano is left with the dilemma of letting Roxann believe a lie…or will he tell her the truth? This entry was posted in Book Reviews, Poetry and tagged 1898, Book Reviews, books, Christian de Neuvillette, Cyrano de Bergerac, Cyranose, Edmond Rostand, French plays, French Poetry, musketeers, old books, Poetry, Roxann, William Shakespeare, Wishbone on April 19, 2017 by The Mithril Guardian.